How do you measure absence? Both weight and silence figure prominently for first-time author Heather Gudenkauf. Weight as the presence of pressure, a pulling toward the earth; silence as simple absence. The Weight of Silence came out just a month ago. Through MotherTalk, I received a complimentary copy and was offered a $20 gift certificate to Amazon.com. This book tells, from multiple standpoints, about Calli and Petra, two 7 year old girls who go missing one late summer morning. Calli hasn't spoken in 3 years, since the neonatal death of her baby sister. Petra is Calli's best friend and voice. Their two families deal with a parent's worst nightmare, confronting weighty unspoken secrets along the way. I liked this book for the gripping storyline. I was propelled by questions like What caused Calli to become mute? Why did the two girls disappear? What will the parents do when they find out what happened to their daughters? Will Calli's mom EVER leave her abusive husband?? But I found the narrative style distracting. Chapters headed by Petra/the parents/brother/lawman are told in the first person, present tense. And chapters headed by Calli are told from the third person, past tense. I'm sure the author had a good reason for narrating this way, but it felt bumpy to me. The book is a fast read because each chapter is just a few pages long. I found myself just reading "one more chapter" long into the night. 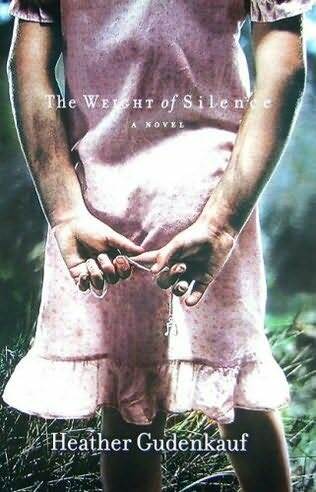 Weight of Silence is a good read. Not a great read, not a life-changing read, but a good read. I give it a thumb up. I am giving away my copy to a random commenter. Leave your entry by midnight September 5, and I'll send one bookie my near-new copy. Want more entries? Tweet or blog about this giveaway, then come back here to leave your URL in another comment/entry. Random.org selected #2, which means Kristin gets the book. Thanks to Wally and Sheri, too! Sounds interesting. My wife would love it. I'll let her know about your blog. Oooh, I'm always excited by the idea of free books. It sounds like a good book and I liked your honest review. Thank you!